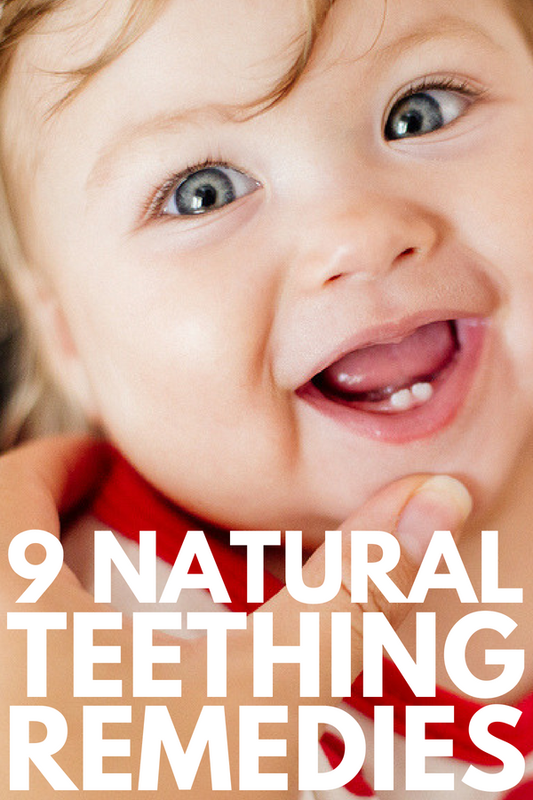 9 Natural Teething Remedies for Kids That Actually Work! If you’re looking for natural teething remedies for kids, you’ve come to the right place! My daughter started second grade at the beginning of the month, and while I was snapping photos of her toothless grin on the first day of school, I felt myself silently wishing that time would slow down for a little while. It feels like just yesterday that my husband and I brought her home from the hospital, and now she’s reading chapter books and correcting my grammar! One of the things that has shocked me the most about parenthood is how all-consuming it is. Even though the challenges we face change as our children grow, they still have the capacity to completely take over our lives. We worry about every single one of our child’s milestones, and we want to find ways to remove any pain or suffering along the way. We read countless parenting articles and try a million different things to help maintain some semblance of peace and normalcy when things get off track, and the moment things settle down, life throws another curve ball at us and we start the process all over again. I have spent countless days and nights researching about colic, sleep regressions, natural solutions for colds and flus, picky eating, natural first aid products, dental health, and how to coast through back-to-school season without losing my sanity, and when Boiron asked me to partner with them to share my best teething remedies for kids, I knew I’d met my match. You see, teething was not a fun time for my family. While my daughter was a late teether and didn’t exhibit teething symptoms for months on end like some kids, she experienced pretty intense pain, fussiness, and sleep disturbances each time she cut a new tooth. I remember feeling pretty desperate at the time, and I wasn’t sure how we’d make it through all 20 teeth. But like all things related to parenting, I eventually found solutions that worked for us, and I barely even remember her molars coming through. So, whether your child is cutting his or her first tooth, the dreaded eye teeth, or the first molars, I’m teaming up with Boiron to share 9 tried and tested teething remedies for kids to help relieve pain and make your little one more comfortable. While some children start cutting teeth as early as 3 months, others may not get their first tooth until after their first birthday, but most children start exhibiting the tell-tale signs of teething somewhere in the six- to twelve-month range and have their full set of baby teeth by their third birthday. Sucking, biting, and chewing on hands, clothing, toys, etc. Some kids are only uncomfortable while their teeth are erupting through their gums, whereas others seem uncomfortable for months on end. It’s hard to say how your child will react, but equipping yourself with natural teething remedies is a great first line of defence in ensuring you are prepared and ready for action when the time occurs! When you search for natural teething remedies for kids on Google, all kinds of great ideas pop up, many of which involve herbal remedies, amber necklaces, and essential oils. I’m sure all of these work wonders in keeping teething children happy and helping to minimize their pain, but I like to exercise caution when recommending the use of these remedies in children. I’m also not fond of using jewelry in young kids as they pose a choking hazard. The good news is that there are heaps of other natural teething remedies that are just as, if not more effective in keeping kids comfortable when they’re cutting teeth, and I’m excited to share 9 that worked wonders with my own daughter below! We all know that teething causes the gums of babies and toddlers to become red, swollen, and inflamed, and we compensate by offering cold teethers and foods to help reduce swelling and pain, but what few of us realize is that the foods we’re feeding to our children can make inflammation worse. If you’re starting to notice signs of teething in your little one, remove inflammatory foods like sugar, white breads and pastas, and fried foods and replace them with fruits, vegetables, lean sources of protein, healthy fats, nuts, seeds, and beans to see if things improve. While we’re discussing food, another natural remedy for teething pain is to rub a little freshly peeled ginger root onto your child’s gums. The anti-inflammatory properties of the ginger will help remove inflammation and make your little one more comfortable. If you’ve ever lived with a teething baby or toddler, you know that it can cause serious disruptions in sleep for the entire family. This is completely normal, but since sleep deprivation can make it harder for a child to fall asleep – and stay asleep – and also weakens the immune system, causes inflammation, and makes kids irritable, try to find ways to ensure your child doesn’t become overtired. Go for stroller walks or long drives when your child becomes cranky, and try not to fret if your little one’s sleep routine gets out of whack for a short period of time. You will eventually get back on track. When I asked my mom friends for natural teething remedies when my daughter first started cutting teeth, a lot of them told me to rub vanilla extract on her gums. Intrigued, I did some research and it turns out this is a widely-used remedy for toothaches, so you can keep this idea on hand for older kids as well. Vanilla is also said to help with anxiety and upset tummies, so if your little one is anxious and feels unwell due to all of the excess drool he or she has been swallowing, this is a great option to try. When my daughter was teething, I spent a small fortune on all of the different teething rings I saw in stores and online. We must’ve had about 25 of them stashed throughout our house, and while they certainly brought her relief, I quickly learned that a frozen wash cloth works just as well, if not better than your average teething ring. I found my daughter was able to chew and manipulate the cloth for maximum relief, and made sure we had at least 10 frozen wash cloths in our freezer at all times. I simply ran each cloth under cold water, rang them out slightly so they were saturated but not soaked, and then placed them into individual plastic bags before throwing them in the freezer. This ensured I had something I could easily grab in the middle of the night or stuff in my purse for on-the-go pain relief without worrying about germs. Another great natural remedy for teething pain is to offer frozen treats your child can enjoy to numb the area and relieve pain. You can make your own popsicles with pureed fruits, natural fruit juices, or a combination of the two. Simply pour into a popsicle mold, freeze, and enjoy! Another option is to add your child’s favorite fruits to a mesh teether and freeze so they can bite and chew for instant relief. We found blueberries and grapes worked best for this! As you’ve probably gathered, offering your child frozen things to chew on is one of the best ways to offer immediate relief from teething pain, and spoons are another option you might consider. Pop a few in the freezer for a few hours and you have a great natural teething remedy that works wonders in soothing sore gums! 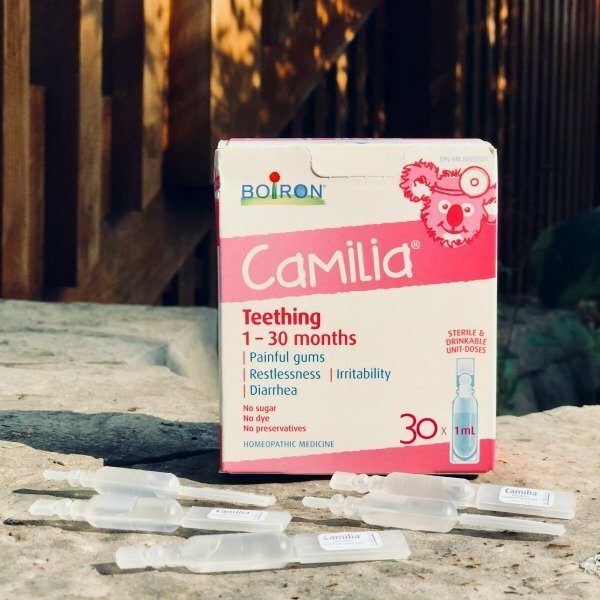 If your child is restless and irritable and experiencing pain and/or diarrhea due to teething, and stroller walks, ginger root, and frozen popsicles just aren’t cutting it, Camilia is another great teething remedy to try. 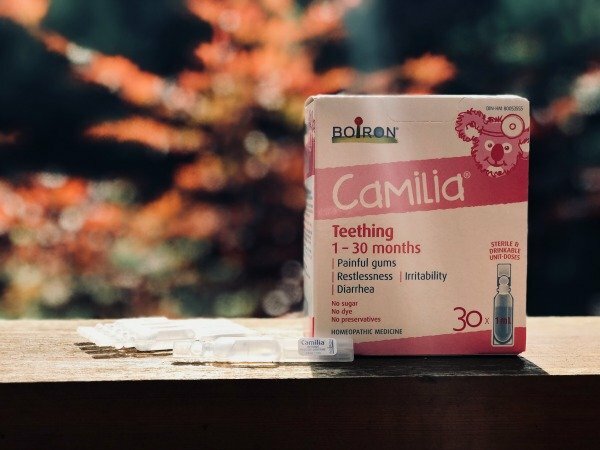 Made with sterile water and completely free of sugar, artificial colours, preservatives, and benzocaine, Camila is suitable for babies and toddlers aged one to 30 months. Camila is completely tasteless and comes in sterile, drinkable, and unbreakable unit-doses that are really easy to administer. Simply squeeze into your child’s mouth for quick relief! If one dose hasn’t provided enough relief, feel free to follow up with a second one 15 minutes later. You may administer up to 6 unit-doses over a 24-hour period for 3 to 8 days. 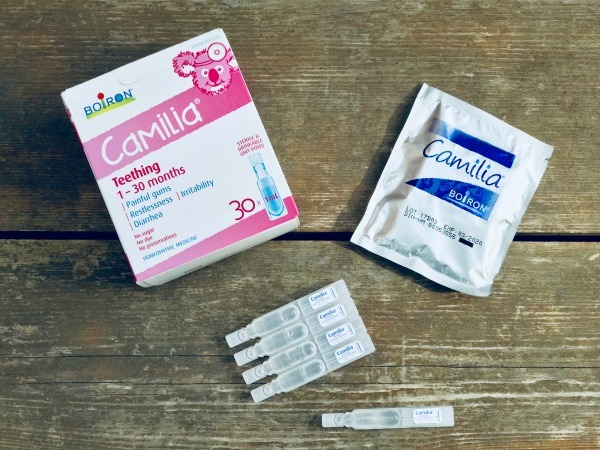 I used Camilia every single time my daughter cut a new tooth throughout her baby and toddler years, and found it was most effective when I followed the dosing advice on the package: administer a dose at the onset of symptoms and repeat as needed every 15 minutes up to 3 doses. Repeat again once the symptoms return, being careful not to exceed 6 doses per day. What I love most about Camilia is that it’s tasteless and has the same consistency as water. My sweet girl really struggles with sweet-tasting medications with a thick consistency, and since I’m not a fan of using OTC medications unless I really need to, Camilia gave me a little something extra to fall back on when she felt particularly miserable and none of my other natural teething remedies were working. Find out more about Camilia and where you can purchase it HERE. My last natural teething remedy is to give your child a little extra TLC. Get down on the floor and play with him or her more, get out of the house as much as possible, and offer lots of cuddles. I know you do all of these things every single day, but when you up your game and ensure your little one has less time to think about how miserable his or her gums feel, the happier the whole family will be! I hope this collection of natural teething remedies for kids inspires you to find ways to help your child feel more comfortable while he or she is cutting new teeth. It may take a little trial and error on your part, but once you find a few ideas that work for your child, the teething process won’t feel as long and overwhelming. To find out more about Boiron – the number one brand of homeopathic medicines recommended by pharmacists* – and the medicines they offer, CLICK HERE. *Pharmacy Practice+ and Profession Santé 2015 Survey on OTC Counselling and Recommendations. If you found these natural teething remedies for kids helpful, please share this post on Pinterest! And if you’re looking for more parenting tips and tricks, please follow our Parenting board where we share all kinds of great advice we find each day!